"Dear Mr Rudd hopes to help resume the conversation between public intellectuals and government, which broke down so badly during the Howard years. It hopes to play a part in suggesting that solutions to our problems need not be framed by the neo-liberal and neo-conservative perspectives that have threatened to dominate public discourse in recent times." "When I began commissioning the chapters for this book, what I discovered was that, among the commentators I approached, the hopes I felt about the new possibilities that would open up for Australia if a Rudd Labor government was elected were very widely shared. So was its main ambition - to issue an invitation to all interested citizens to participate in the discussion of ideas about how, in this new era, a better Australia might be built." "During the period of the Howard government, the nation's critical intelligentsia had been treated by government ministers, Coalition backbenchers and right-wing commentators as un-Australian traitors. Unwelcome voices [...] had been, by one means or another, marginalised or silenced." "With the coming of a new government, in an atmosphere of new possibilities, at the end of the barren Howard years, would there not now be an opportunity for conversation between the government and the nation's public intellectuals and independent policy experts to begin again?" Paul Keating once said: "Change the government and you change the country." Just imagine for a moment that you were in conversation with the new PM - what would you tell him about your expectations and hopes for Australia's future? In Dear Mr Rudd, leading Australian thinkers offer essays on key areas of interest: climate change, the economy, human rights, the republic, water and much more besides. Each letter is passionate and imaginative and will create discussion and debate. On the eve of the Australia 2020 summit, here is a set of new ideas to provoke and inspire - not just for our nation's leader but for all Australians. About the publication Robert Manne (ed), Dear Mr Rudd: Ideas for a Better Australia (2008): This book is now out of stock, and we no longer supply it to our members or to the wider public. We suggest you could search for online new or second-hand bookshops to secure your copy. 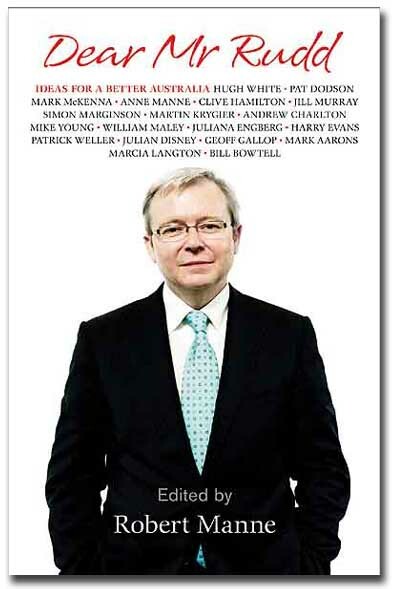 19 March 2008: An Extract from Robert Manne et al, Dear Mr Rudd: Ideas for a Better Australia - "When I began commissioning the chapters for this book, what I discovered was that, among the commentators I approached, the hopes I felt about the new possibilities that would open up for Australia if a Rudd Labor government was elected were very widely shared." 1 August 2005: Do Not Disturb: Is the Media Failing Australia? - Is our media doing its job when it comes to Australian politics? Is it frank and fearless in pursuit of spin and evasion? Why have we entered an era of shockjocks and celebrity commentators? What will changed media rules mean for our public sphere? 26 June 2007: Clive Hamilton, The Australian, Free Speech and Hypocrisy - "This sorry story sheds a different light on the noble appeals of ... The Australian ... for a more open society in which free speech and a variety of opinions are not just tolerated but encouraged. The newspaper's defence of high principle is vitiated by its slavish support for the Howard Government, including its attacks on the Government's critics." 28 February 2007: Clive Hamilton and Sarah Maddison, Silencing Dissent: How the Australian government is controlling public opinion and stifling debate. The book Silencing Dissent uncovers the tactics used by John Howard and his colleagues to undermine dissenting and independent opinion. Bullying, intimidation, public denigration, threats of withdrawal of funding, personal harassment, increased government red tape and manipulation of the rules are all tools of trade for a government that wants to keep a lid on public debate. Your attempt to portray Dear Mr Rudd as a "leftist manifesto" - Dennis Shanahan (26/2), Janet Albrechtsen (27/2) and editorial (27/2) - is risible. Among our contributors are Harry Evans (the parliament), Hugh White (defence), William Maley (foreign affairs), Patrick Weller (public service), Marcia Langton (indigenous affairs), Geoff Gallop (federalism) and Martin Krygier (civil liberties). Anyone who knows their way about the contemporary Australian political culture understands that such authors do not belong to the Left. The Australian seems to assume that unless a government agrees with views in advance they are not worth arguing. I take the opposite view. So I assume does the Prime Minister. As our book was going to press, he called an ideas summit. The kind of conversation Dear Mr Rudd is concerned with inviting is to begin in earnest earlier than even I, to use your terminology, had dreamed possible. Your newspaper's hostility to all ideas other than your own seems to me not conservative but nihilistic. Click the button below for a 30-minute conversation between Robert Manne and Martin Krygier, one of the book's authors, on civil liberties and human rights in Australia. Note: the movie is shown in a "pop-up window", and your computer must be set to allow pop-up windows, and you need to have a recent Flash movie version installed. A few days ago in Crikey, Clive Hamilton drew attention to the rage-virus that infects The Australian at the mention of Robert Manne. The lurching hostility of the Right's attack zombies (scarcely a day goes by in which he's not abused by name in The Australian's Op Ed pages) constitutes its own tribute to Manne's achievements. While most academics kept their heads well down during the Howard years (quick quiz: name another Australian Professor of Politics?) Manne addressed every topic of public controversy, from Aboriginal history (Whitewash) to immigration (Quarterly Essay 13: Sending Them Home), from media ownership (Do Not Disturb) to the Iraq war (Why the War was Wrong). As a consequence, he's probably the only person with the cultural and political capital necessary to so quickly produce a book like Dear Mr Rudd (Black Inc, 2008), in which an array of writers who, in Manne's words, "stood against the predominant neo-liberal, neo-conservative tide" now present a positive program for the new government. From the conniptions at Chateau Murdoch, you might think that Dear Mr Rudd consisted of unbridled moonbattery. Of course, it's nothing of the kind: and most of its essays sit fairly comfortably within the policy mainstream. Martin Krygier suggests that traditional understandings of the rule of law might prove more effective in combating terrorism than draconian police state measures; Patrick Weller thinks that a public service that's not terrorised by politicians might contribute to good government; William Maley argues for a foreign policy based on multilateralism, more distance from the US and a greater engagement in Southeast Asia and the Pacific; Harry Evans wants parliamentary behaviour improved. The very modesty of these proposals hints at the difficulty underlying the whole project: how do you put forward a reform program to a government that has repeatedly and publicly declared itself both socially and economically conservative? Mark McKenna, for instance, is an impassioned and elegant writer, and he makes a compelling case for a republic: "Why should we continue to endorse discrimination on the basis of birth, gender and religion by failing to install a republican head of state?" Yet his chapter also notes Kevin Rudd's explicit statement that a republic is not an immediate priority for Labor - which, in some senses, constitutes an answer to the "Dear Kevin" letter even before it is sent. Elsewhere, Clive Hamilton warns that a 3-4 degree increase in average global temperatures will bring "a doubling of the number of very hot days (over 35 degrees) in the eastern states; catastrophic mortality of coral species; loss of more than half of the core habitat for Eucalyptus species; a possible 50 per cent fall in water flows in the Murray-Darling Basin; and substantial increases in extreme weather events, including cyclones, bushfires and storm tides." Avoiding utter disaster requires, he says, "far-reaching structural change to the energy economy". Quite obviously, global warming poses a tremendous challenge, and one that would test the mettle of even to the most reform-minded government. Yet, as Andrew Charlton notes in a different chapter: "Rudd's economic message to the Australian electorate in 2007 was conservative, essentially shadowing Howard on most economic issues, offering the same core policies wrapped in slightly updated packaging." For his part, Charlton responds to this dilemma with breezy cynicism. He says that Labor needed to hide its intentions in order to get elected but insists that a Rudd government, taking power on the cusp of a global slowdown, must nonetheless introduce radical economic reforms. "[A]lthough they were elected on a mandate of continuity," he argues, "they will have to govern on a theme of change." In respect of the economy, one can actually imagine Rudd carrying through quite radical measures: Wayne Swan has, after all, already boasted about the cuts he's preparing to make. But the pressure to ensure economic competitiveness only underscores the difficulties facing social campaigners. The most right-wing leader in Labor's history overseeing an economy heading into the doldrums: well, let's just say it's not exactly a conjunction conducive to reform. But that's what makes Dear Mr Rudd important. In his introduction, Manne writes about fostering a "conversation between the government and the nation's public intellectuals and independent policy experts." A dialogue that extends that far and no further will make very little difference. As Jill Murray notes in her chapter on workplace relations, "the very idea of having to appeal to one man comes pretty close to some of the dangerous modes of decision making of the previous government." If that's all Dear Mr Rudd entails, Kevin07 will simply thank Robert Manne for his good ideas - and then pour them down the sink. But both Manne and Murray also suggest that the book should be understood as an attempt to foster a broader debate: "an invitation," Manne writes, "to all interested citizens in the discussion of ideas about how, in this new era, a better Australia might be built." One suspects that it's this prospect that motivates The Australian's maniacal hostility: for conservatives, a policy discussion outside the tete-a-tetes of a gerontocratic elite in Quadrant seems contrary to the laws of nature. The disengagement of ordinary people from political debate marks one of the characteristic features of our era. It's interesting, in that regard, to compare Dear Mr Rudd with the Labor Essays, a similarly structured collection of policy discussions that Pluto Press used to publish annually. The difference in titles is itself symptomatic: where Labor Essays emanated from the Australian Fabian Society, Dear Mr Rudd, though addressed to a Labor PM, possesses no obvious organisational affiliation. Only a few of its contributors (Geoff Gallop, for instance) could be unambiguously linked to the ALP, and the only chapter that discusses the Labor Party does so on entirely on the basis of its internal dysfunction. (Parenthetically, Mark Aarons' suggestion that Labor should sever its union ties seems a strategy certain to add to the disenfranchisement of the rank-and-file: just think of the American Democrats. But that's an argument for another day). Once upon a time, the election of a new government would have led to a rush of new Labor memberships. But, like the contributors to Dear Mr Rudd, most Australians feel that our atrophied and sclerotic political parties offer no outlet for democratic participation. Where, then, does public policy discussion take place? In underfunded universities increasingly devoted to abstruse specialisation? In newspapers dominated by the antics of Britney Spears and Paris Hilton? Given the ever-shrinking public sphere, the efforts of genuine public intellectuals become more important than ever, since the discussions they initiate can - potentially, at least - develop a momentum amongst ordinary people. That's why this book matters: not because it provides some ideas to throw around during the ersatz 2020 forum, but because it might help nourish a conversation beyond the usual suspects, and thus provide the basis for grass-roots change. Take a concrete example. In his chapter on reconciliation, Pat Dobson rightly insists on the need for much greater dialogue with Indigenous people. He proposes "a series of focused forums in every state and territory, involving Indigenous leaders, prominent industry representatives, politicians from across the spectrum, key public servants, trade union and church leaders, academics and a range of distinguished Australians of wisdom and experience to explore in detail a policy and philosophical framework that can support the rebuilding of Indigenous communities and honour Indigenous people's place in the Australian nation." Will a poll-driven, risk adverse politician like Rudd take on such an ambitious and controversial program? Probably not. But even if he did, a process conducted entirely from above would be most unlikely to succeed. The forums Dodson advocates require the enthusiasm and energy of ordinary people, both black and white, rather than the benediction of a prime minister: they need, in other words, to be built from the bottom up rather than the top down. One of the striking facets of last year's election was that the Rudd team spent more of its time dampening expectations about the future rather than raising them. Dear Mr Rudd will, hopefully, lead to more conversations in homes and schools and workplaces about how something could and should be done about Aboriginal disenfranchisement and climate change and scores of other issues. Once they're begun, who knows where such discussions might end? Whatever happened to the "new civility"? Google the search string "robert manne dear mr rudd" restricted to the website of The Australian's blogs, and you end up with a bizarre collection of invective filled weirdness. That's excluding the leaders, of course, but you don't need to read them to imagine what's in them. In one way, this is all amusingly counter-productive, as one would imagine the somewhat worthy tome in question would have struggled to attract as much attention on the basis of its contents - it's a book publicist's dream. None of it seems to have any relationship to the recent call for a "new civility" from The Australian, and as Jeff Sparrow observes in today's Crikey, the book is hardly "unbridled moonbattery". I'm not even too sure that chapters by Patrick Weller on the public service or Harry Evans on the role of the Senate have anything to do with "the left". In his introduction, Manne writes about fostering a "conversation between the government and the nation's public intellectuals and independent policy experts." A dialogue that extends that far and no further will make very little difference. As Jill Murray notes in her chapter on workplace relations, "the very idea of having to appeal to one man comes pretty close to some of the dangerous modes of decision making of the previous government." If that's all Dear Mr Rudd entails, Kevin07 will simply thank Robert Manne for his good ideas -- and then pour them down the sink. It's not only, as Sparrow argues, that the culture warriors really aren't interested in fostering any sort of lively public debate - for one thing, that might produce something that doesn't look like a stereotyped battle of the cliches. More than that, there's a very significant point that rarely seems to be highlighted when this ersatz public sphere is analysed - those who are identified by the Albrechtsens of this world as "the left" are actually not really representative of any broader social or political movement at all - they're journos, commentators and columnists. David Marr and Robert Manne, and Sparrow is surely accurate in saying that if they get denigrated so much they must be doing something right, are pre-eminent examples. Neither really represents a political movement of any kind. Both are best known as commentators. It's a weird kind of shadowboxing that actually depoliticises while generating an enormous amount of faux-partisan heat that's going on here. Citizens, and people actually involved in politics more particularly, and social and political movements crucially, are all erased from the picture while the phantom armies of the commentariat fight their never-ending and never-endingly tedious battles.